These Etsy resume templates will help you get your resume noticed. Resume is one of the most important part of your job search, since you need it to make great first impression and impress the hiring manager and show them that you are the right candidate for the job. In this article we have included beautiful Etsy resume templates that you can use to give your resume a face lift. Our selection of Etsy resume templates are easy to edit and come in Microsoft Word format. Most of all resume templates can save you time since the layout is ready and all you need to do is to fill in your information. Professional Etsy resume template with matching cover letter and reference page. Resume template with photo. Also comes with matching cover letter and reference page. The photo can be easily deleted if you don’t need it. 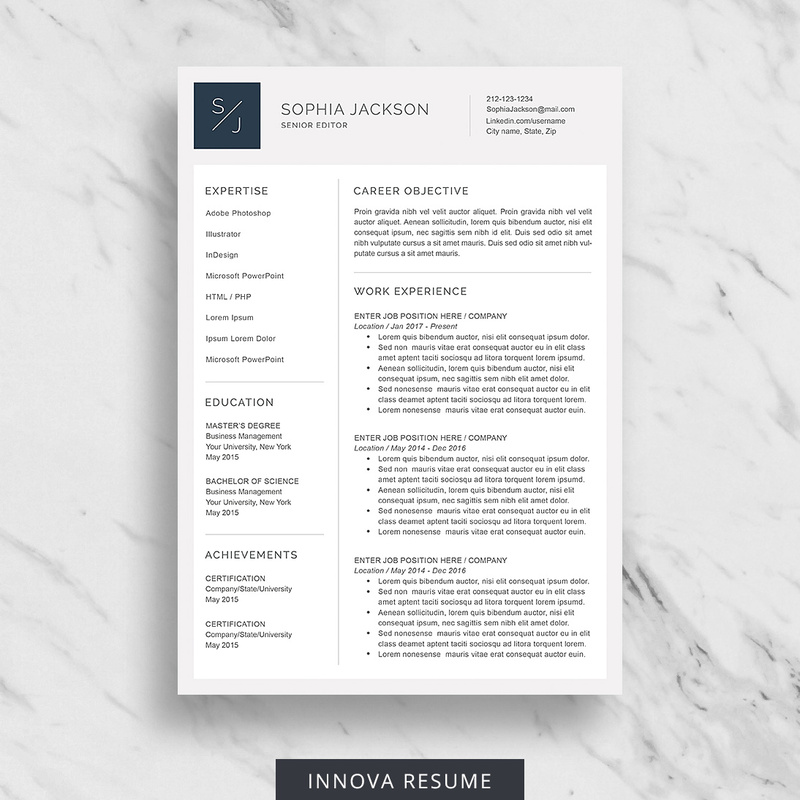 Simple resume design with clean design. Creative resume that has clear design. Modern resume with elegant color scheme. Modern Etsy resume template that with clean design so that you can find important information fast. Resume with 1 & 2 pages. Plenty of space for all your information. Elegant resume with 2 pages and matching cover letter and reference page. Modern CV with 1, 2 and 3 pages and matching cover letter and reference page. This ATS-friendly resume template is included with every purchase made on Innova Resume. The ATS resume has minimal design and is very easy to use. The template is ATS friendly and doesn’t use text boxes or any other elements that the Applicant Tracking System doesn’t read. Sometimes you’ll need more than one resume and with that in mind when you buy 2 resumes you’ll save $5 by using the coupon code: INNOVA2 on Innova Resume Etsy shop. Use one for emailing and one for printing and to take with you to the job interview or use different style for different positions and maybe get one for you and one for your friend.